The aim of present research work was to explore the constituents of the coffee husks oil obtained from Coffee arabica. L (Rubiaceae). Hydrodistillation extraction has been applied to extraction of volatile oil from coffee husks of C. arabica and the chemical constituents of the oil has been investigated by using by Gas Chromatography (GC), Gas Chromatography/Mass Spectrometry (GC/MS) and carban-13 Nuclear Magnetic Resonance (13C NMR). GC and GC-MS analysis reveals the presence of fifty five components in a significant amount in the coffee husk volatile oil. The most abundant components present in oil were butylatedhydroxy (65.83%), 1, 2-benzenedicarboxilic acid (7.28%), phenylethyl alcohol (1.69%) and 2, 3-isopropylidene-6-decoxyhexo (1.63%). Essential oil as well as ethanol extract were screened for antimicrobial and antioxidant activities and were found active against both the assays. Production of large volumes of wastes from agricultural activity and food industry during the processing, production, and consumption of food has increased waste disposal which could result in severe environmental pollution problems and represent a loss of valuable biomass and nutrients . In the recent years, several processes have been developed to utilize these industrial residues for the production of value-added phytochemicals and fine product such as ethanol, mushrooms, organic acids, enzymes, amino acids and secondary metabolites with interesting biological activities [2-4]. Consequently, the food and agricultural wastes nowadays are receiving great attention, as they represent a possible and utilizable resource for conversion to useful products . Coffee (Coffee sp.) is considered as one of the most popular food commodities in the world and ranked second after oil in terms of currency traded globally . The large production and consumption of coffee generates sizeable volumes of solid residues such as coffee husks and pulps . Coffee husks/pulps are mucilaginous fibrous substance containing some amount of caffeine, tannins and phenolic compound [8,9], which makes the by-product highly toxic and slow degradation in nature, resulting in disposable problem . However, literature studies has shown that coffee husk is rich in, carbohydrates, protein, organic matter (hemicelluloses, cellulose, lignin and pectin) [11,12] and chemical nutrients such as nitrogen and potassium , which makes it ideal substrate for the production of useful products . Moreover, very recently coffee husks are reported to be the potential source of anthocyanin cyanidin-3-rutinoside . Commercially coffee husks has been used as a fermented tea such as coffee cherry tea, cascara, sultana, qishrorbun, whereas coarse powdered coffee husks are used as food supplements in granolas, smoothies and juices. Although the reported applications of coffee husks includes, as an additive in animal feed, production of bulky chemical compounds, fermentation for production of numerous products , as an absorbents , as a fertilizers  and as a raw material for fuel production . However, keeping in consideration the sizeable amounts generated and only a small portion of this solid residue is being used for practical applications, there is still need to find other alternative uses for this frequently produced solid residue. Considering the growing knowledge of health-promoting potential of secondary metabolites and presence of various types of important compounds in the coffee husk residue, the isolation of these chemical constituents appears as an efficient alternative to increase the aggregated value of the agroindustrial wastes. A number of phytochemical studies have been conducted for the evaluation of pharmacologically constituents in the coffee husk to deal with its reported medicinal properties. However, there is no data reported in the literature regarding oil extraction and its constituents from coffee husk. In the present study our focus is on coffee husks, an agro- and food industry wastes that can be utilized as a valuable and cheap source of antioxidants and free radical scavenging compounds. We have chosen coffee husks of Coffee arabica, an economically important variety of genus Coffea, growing in Saudi Arabia. Among all the species, C. arabica is considered as superior due to its armoa and sensory properties  and therefore reaches higher prices in the international markets . Phytochemical studies on non-volatile fraction of C. arabica coffee seeds showed the presence of carbohydrates, fibers, amino acids, lipids, minerals, organic acids, chlorogenic acid, trigonellic and caffeine [22,23], whereas volatile fraction was found to be composed of hundred different types of volatile compounds such as alcohol, esters, hydrocarbons, aldehydes, ketones, pyrazines and furans . Furthermore the studies have revealed that maturation of coffee cherries is essential for good composition of volatiles . Thus, keeping in consideration the presence of appreciable amount of volatile content in coffee berries, the possibility of volatiles in coffee husk is high. In the present study, we intend to investigate the volatile composition of husk of C. arabica and evaluation of antimicrobial and antioxidant potential of isolated volatile oil along with alcoholic extract of C. arabica husks. 1, 1-diphenyl-2-picrylhydrazyl (DPPH) from ( Sigma St. Louis, MO, USA), Ascorbic acid from Credible suppliers (Shanghi, China), Ampicillin (Sigma-Aldrich), Doxycycline (Sigma-Aldrich), Nystatin( Sigma St. Louis, MO, USA), UV/ visible light spectrophotometer (Spectronic 20 D+, Thermo Scientific, USA), 13C-NMR- Bruker AM 700 (Bruker Topspin Gmbh, Rheinstetten). The fresh coffee berries of C. arabica were collected from the Kholan Bin Amer region of AbdulAziz Al-Melahe Farm (Sana'a, Yamane), northern border of Saudi Arabia. The plant material was identified and authenticated by Dr. Mahmoud Abdul Aziz Mahmoud, and a voucher specimen (PDH#437) has been deposited at the herbarium, college of pharmacy, King Saud University, Riyadh. The air dried coarse powdered coffee husks (CHs, 1.85 kg) were extracted by maceration with 95% ethanol at room temperature. After filtration and the combined ethanolic extract was evaporated using rotary vacuum at 45°C to obtain dark brown gummy extract (153.7 g, yield 8.31% w/w). Air-dried husks (100) obtained from C. arabica berries were subjected to hydrodistallation for 3-4 h using an all glass Clevenger-type apparatus as per the procedure recommended in Egyptian Pharmacopoeia to obtain essential oil 0.31% v/w yields as presented in the Table 1. The oil collected was dried over anhydrous sodium sulphate and kept at 4°C in sealed colored vial until analysis. Table 1. Chemical composition of the essential oil of Coffee arabica L. husks growing in SA. The GC-MS analysis was performed in a Perkin Elmer Clarus 600 gas chromatograph inked to a mass spectrometer (Turbomass) available at Central Laboratory, College of Pharmacy, King Saud University, Riyadh. An aliquot of 1 μL of extract was injected into the Elite-5MS column of 30 m, 0.25 μm film thickness, 0.25 μm internal diameters. The GCMS system starts with the initial oven temperature of 40°C increasing to 150°C at a rate of 5°C for 2 min, and then to 300°C at a rate of 5°C for 2 min. The injector temperature was maintained at 220°C. The interface temperature was 240°C. Helium was used as a mobile phase at a flow rate of 1.0 ml/ min. Mass spectral detection was carried out in electron ionization mode by scanning at 40 to 600 m/z. Finally, unknown compound was identified by comparing the spectra with that of the National Institute of Standard and Technology library 2005 and Wiley Library 2006. The total time required for analyzing a single sample was 58 min. The results are represented in tabular form. 13C-NMR spectrum of essential oil was recorded on a Bruker AM 700 operating at 176.0 MHz for 13C-NMR, NMR spectrometer (Research center, college of pharmacy, King Saud University) equipped with a 5 mm probe, in deuterated chloroform. The spectrum was recorded with the following parameters: Pulse Width (PW): 12 μs, Acquisition time (AQ): 0.786432 s for 295.0 K data table with Spectral Width (SW) of 41666.668 Hz (250 ppm). The number of accumulated scans was (NS) 4000 for oil sample. An exponential multiplication of the free induction decay with the line broadening of 0.635783 Hz was applied before transformation. The components were identified on the basis of GC retention time and matching with Wiley 2006 library as well as by comparison the fragmentation patterns of their mass spectra with those reported in the literatures [26,27] and various of the identified components were identified as phenolic, amides, sesquiterpenes, sterols, fatty acids, furanol compounds, alkanes and alcohols. A total of 55 detectable peaks were selected for essential oil. Microorganisms: American Type of Culture Collection (ATCC) standard against various microorganisms namely: Staphylococcus aureus, Escherichia coli, Pseudomonas aeruginosa, and Candida albicans were used. The agar well diffusion method, Perez et al. 1990 as adopted earlier, was used. Diluted inoculum (0.1 ml, 105 CFU/ml) of test organism was spread on Muller-Hinton agar plates . Wells of 8 mm diameter were punched into the agar medium and filled with 100 μl of ethanol extract and oil of 100 mg/ml concentration and solvent blank (DMSO) separately. The plates were incubated for overnight at 37°C. The antibacterial activity was evaluated by measuring the zone of inhibition against test organism. Antibiotics (Ampicillin and Doxycycline) were used as positive control against bacteria while Nystatin was used as the control antifungal drugs. Each experiment was performed in triplicate (National committee for Clinical Laboratory Standards, 2002). Minimum inhibitory concentration of ethanol extract as well as volatile oil of coffee husk against drug resistant clinical strains was determined by broth dilution method, using specific dye (p-iodonitro tetrazolium violet) as an indicator of growth as described by Eloff . Briefly, 2 ml of the plant extract and essential oils were mixed with 2 ml of Muller-Hinton broth (Hi-Media Ltd., Mumbai, India) and serially diluted into the next tube and so on. Actively growing culture (2 ml) of different test strains was added before incubating for overnight, at 37°C. After examining turbidity visually, 0.8 ml of 0.02 mg/ml indicator dye (p-iodonitro tetrazolium violet) was added to each tube and incubated at 37°C. The tubes were examined for the color development, after 30 min. Absence of growth was also confirmed by spreading 0.1 ml of broth from each test tube on normal nutrient agar plates. MIC is defined as the minimum concentration of ethanol extracts as well as essential oil which inhibited the visible growth of test strains. All experiments were performed in triplicates and the data obtained from experiments were presented as mean values and the difference between control and test were analysed using student’s t-test. The essential oil isolated by hydrodistallation from the coffee husks of C. arabica, dried under different conditions was found to be light yellow liquid with a characteristic aromatic odor, soluble in ether, chloroform, insoluble in water. Fifty five compounds were analysed in the essential oil of coffee husks in which the main components were butylatedhydroxy (17, 65.83%), 1, 2-benzenedicarboxilic acid (31, 7.28%), phenylethyl alcohol (6, 1.69%) and 2, 3-isopropylidene-6- decoxyhexo (21, 1.63%) and these accounted for 82.4% of the oil. While as linalool (5, 0.07%), trans-methyl dihydrojasmonate (23, 0.08%), pregnan-3, 11-diol-20-one (24, 0.07%), heptadecanoic acid (26, 0.08%), cholest-5-en-3-ol (3. BETA) (38, 0.12%), hexadecanoic acid (37, 0.23%), and bis- (3, 5, 5-trimethylhexyl) eth (28, 0.06%) were present as minor constituents (Table 1 and Figures 1-3). All the identified compounds are listed in Table 1 along with their peak numbers and their relative percentage in the composition. The 13C-NMR spectra essential oil was recorded in deuterated chloroform (CDCl3) on a Bruker AM 700, NMR spectrometer operating at 176.0 MHz (Bruker Topspin Gmbh, Rheinstetten, Research center, college of pharmacy, King Saud University) equipped with a 5 mm probe (Figure 4). It showed that the protonated carbon signals are consistent with those of common hydrocarbons. Current results, which describe the first detailed analysis of C. arabica husks by using GC/MS and 13C-NMR, confirm the chemical constituents of this plant. 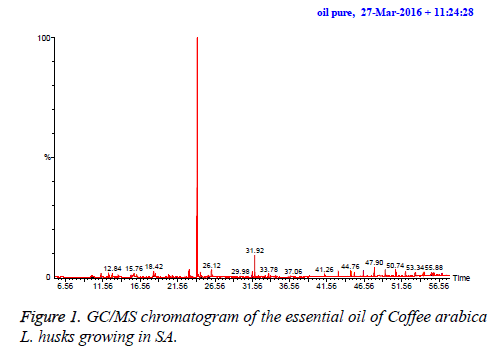 Figure 1: GC/MS chromatogram of the essential oil of Coffee arabica L. husks growing in SA. 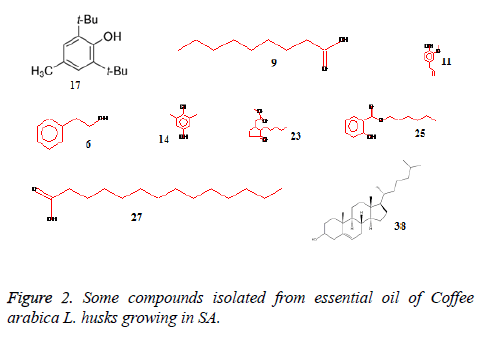 Figure 2: Some compounds isolated from essential oil of Coffee arabica L. husks growing in SA. Figure 3: Mass spectra of some essential oil components of Coffee arabica L. Husks growing in SA. 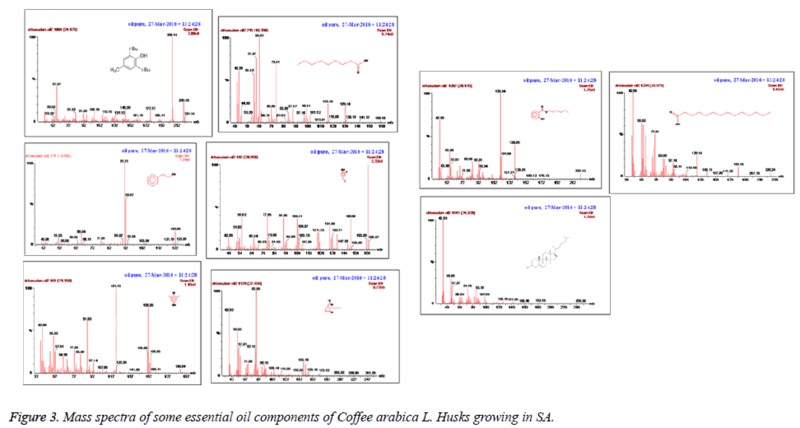 Figure 4: 13C NMR spectrum (176.0 MHz, CDCl3) of essential oil components of Coffee arabica L. Husks growing in SA. (10.0 mg, CL). NS=4000, AQ=0.786432 s.
Moreover, biological evaluation of essential oil and extract for antimicrobial and antioxidant activities was also carried out. A comparative biological study were done for the first time isolated volatile oil and total alcohol extract of coffee husks obtained by maceration, presented in Tables 2 and 3. Both volatile oil and total alcohol extract from C. arabica husk possessed antibacterial and antifungal activities against all of the tested gram positive and gram negative bacterial and fungal strain, with the diameters of zone inhibition ranging between 13-17 mm and 14-22 mm for volatile oil and total alcohol extract respectively. The most activity was seen from total alcohol extract and this extract inhibited the growth of all the bacterial strains tested, S. aureus, E. coli, P. aeruginosa by 22.0, 17.0, and 20.0 mm respectively when compare to ampicillin, doxycycline and doxycycline by 21, 25 and 24 mm respectively. Furthermore, about the fungus studied, C. albicans was susceptible to the both volatile oil and total alcohol extract by 15.0 and 14.0 mm, respectively when compare to nystatin by 23 mm, with MIC-values 0.8 and 3.2- >3.2 mg/ml for volatile oil and total alcohol extract respectively. In this Study on C. arabica it has shown that the total alcohol extract offered a potent activity against S. aureus by 22.0 mm (104.8%) when compare to the ampicillin by 21 mm. Moreover, the DPPH-radical scavenging assay exhibited a significant antioxidant activity at a dose dependent manner of both volatile oil and total alcohol extract from C. arabica by 18.39 and 36.4 at 12.5 μg/ml respectively, when compare to ascorbic acid by 34.91 (Table 4). Table 2. Antimicrobial activity of the essential oil and total alcohol extract of Coffee arabica L. Husks growing in SA as inhibition zones (mm). Table 3. Minimum Inhibitory Concentration (MIC) of the essential oil and total alcohol extract of Coffee arabica L. Husks growing in SA against bacterial and fungal strains. Table 4. Free radical scavenging activity of the essential oil and total alcohol extract of Coffee arabica L. Husks growing in SA by DPPH. Previous studies showed that there is no data available for the presence of volatile oil in coffee husk. However, presence of oleoresin masses in husk organs in botanical studies indicated the possibility of volatiles is high, which stimulated us to isolate volatile oil and identify it’s various constituents. Hydrodistillation of C. arabica coffee husks yielded 0.31% v/w light yellow liquid with a characteristic odor. GC, GC/MS and 13C NMR analysis of the volatile oil resulted in the identification of 55 compounds. According mass spectra observation, 30% and 40% of compounds present in oil content are hydrocarbon and oxygenated constituents while as aromatic compounds dominates. Biological screening of isolated volatile oil and ethanol extract of C. arabica husk against antimicrobial and antioxidant activities have shown significant activities against all tested bacterial and fungal strain and ethanol extract was found to be the most active against S. aureus, E. coli and P. aeruginosa antibacterial strains. Whereas antifungal activity was susceptible to both volatile oil as well as in ethanol extract. Furthermore, both volatile oil and ethanol extract exhibited promising antioxidant at a dose dependent manner. The results concluded in this study appear to emphasize on isolation of volatile oil C. Arabica coffee husk, a major industrial waste and identification of its different constituents. Also, screening of antibacterial, antifungal and antioxidant potential of isolated oil and ethanol extract C. arabica husk, as well as its helpfulness in the treatment of diseases that might be as a cause of infection. Laufenberg G, Kunz B, Nystroem M. Transformation of vegetable waste into value added products. The upgrading concept and practical implementations. Bioresour Technol 2003; 87: 167-198. Pandey A, Soccol CR. Bioconversion of biomass: a case study of lignocellulosic bioconversions in solid state fermentation. Brazilian Arch Biol Technol 1998; 41: 379-390. Pandey A, Nigam P, Vogel M. Simultaneous saccharification and protein enrichment fermentation of sugar beet pulp. Biotechnol Lett 1988; 10: 67-72. Pandey A. Recent process developments in solid-state fermentation. Process Biochem 1992; 27: 109-117. Schieber A, Stintzing FC, Carle R. By-products of plant food processing as a source of functional compounds-recent developments. Trends Food Sci Technol 2001; 12: 401-413. Garcia AWR, Martins M, Salgado AR, Freire ACF. Efeito da adubac¸a˜o quı´mica isoladamente, bem como a sua associac¸a˜o com adubos orgaˆnicos na produc¸a˜o do cafeeiro Mundo Novo. Abstracts of the 10th congresso brasileiro de pesquisas cafeeiras, Poc¸os de Caldas 1983. Fan L, Soccol AT, Pandey A, Vandenberghe LP, de S, Soccol CR. Effect of caffeine and tannins on cultivation and fructification of Pleurotus on coffee husks. Braz J Microbiol 2006; 37: 420-424. Esquivel P, Jimenez VM. Functional properties of coffee and coffee by-products. Food Res Int 2012; 46: 488-495. Murthy PS, Naidu, MM. Sustainable management of coffee industry by-products and value addition-A review. Resour Conserv Recycl 2012; 66: 45-58. Santinato R, Ticle RF, Almeida LS, Silva VA, Dantonio GAC, Moreira WV. Adubac¸a˜o orgaˆnica com palha de cafe´ curtida associada com a adubac¸a˜o quı´mica N-P-K-S na forma compensada durante a formac¸a˜o da lavoura de cafe´ em solo de cerrado-LVE. Abstracts of the 34th congresso brasileiro de pesquisas cafeeiras, Caxambu 2008. Franca AS, Oliveira LS. Coffee processing solid wastes: current uses and future perspectives. Agricultural wastes. New York Nova Publ 2009; 155-189. Brand D, Pandey A, Roussos S, Soccol CR. Biological detoxification of coffee husk by filamentous fungi using a solid state fermentation system. Enzyme Microbe Technol 2000; 27: 127-133. Oliveira WE, Franca AS, Oliveira LS, Rocha SD. Untreated coffee husks as biosorbents for the removal of heavy metals from aqueous solutions. J Hazard Mater 2008; 152: 1073-1081. Berlitz HD, Grosch W, Schieberle P. Food chemistry. Springer Berlin Heidelberg 2009. Wilson L, John GR, Mhilu CF, Yang W, Blasiak W. Coffee husks gasification using high temperature air/steam agent. Fuel Process Technol 2010; 91: 1330-1337. Bertrand B, Guyot B, Anthony F, Lashermes P. Impact of the Coffea canephora gene introgression on beverage quality of C. arabica. Theor Appl Genet 2003; 107: 387-394. Gielissen R, Graafland J. Concepts of price fairness: empirical research into the Dutch coffee market. Business Ethics European Rev 2009; 18: 165-178. Flament I, Gautschi F, Winter M, Willhalm B, Stoll M. Les composants furanniques de larˆomecaf´e: quelques aspects chimiques et spectroscopiques. Proc 3rd Coll Int Coffee Sci ASIC 1968; 197-215. Farah A, Perrone D, Fernandes J, Silanes J. Chorogenic acids and lactones in coffees decaffeinated by water and supercritical CO2 and roasted in a pilot plant scale fluidized bed roaster. Proc 23rd Int Conf Coffee Sci ASIC 2010; 367-372. Toci AT, Farah A. Volatile compounds as potential defective coffee seeds markers. Food Chem 2008; 108: 1133-1141. Ortiz A, Veja FE, Posada F. Volatile composition of coffee berries at different stages of ripeness and their possible attraction to the coffee berry borer Hypothenemus hampei (Coleoptera: Curculionidae). J Agric Food Chem 2004; 52: 5914-5918.